[S541] Colleen S. Neal, "A Legacy of Love, Service, Excellence," The Callaway Journal, vol. 14, p. 28 (1989), (naming Elwood Oliver Larkins as her father). [S541] Colleen S. Neal, "A Legacy of Love, Service, Excellence," above, (naming Sarah Cassandra Callaway as her mother). [S541] Colleen S. Neal, "A Legacy of Love, Service, Excellence," above, (citing Visalia [Calif.] Times Delta, ca. 10 Dec 1954). [S541] Colleen S. Neal, "A Legacy of Love, Service, Excellence," above. [S541] Colleen S. Neal, "A Legacy of Love, Service, Excellence," The Callaway Journal, vol. 14, p. 28 (1989), (naming Dr. Roydon I. Woolsey as his father). [S541] Colleen S. Neal, "A Legacy of Love, Service, Excellence," above, (naming Zoe Portie Larkins as his mother). [S14] "Descendants of Joseph Callaway of Virginia," The Callaway Journal, vol. 5 (1980), p. 76 (giving only the date). [S724] Descendants of Joseph and Peter Callaway (n.p. : The Callaway Family Association, Inc., 2000), p. 1 (giving only the date). [S14] "Descendants of Joseph Callaway of Virginia," The Callaway Journal, vol. 5 (1980), p. 76 (stating that her surname may have been Crawley and not giving the date). [S542] Jill DeGraeve-Cruse, "The Callaway Family," online http://www.zianet.com/schulthe/Genes/Calloway/reports/…, viewed on 12 Nov 1998 (giving the date as circa 1752). [S724] Descendants of Joseph and Peter Callaway (n.p. : The Callaway Family Association, Inc., 2000), p. 1 (giving her surname as Crawley and not giving the date). [S14] "Descendants of Joseph Callaway of Virginia," The Callaway Journal, vol. 5 (1980), p. 76 (not giving her surname or the date but indicating that she was his first wife). [S542] Jill DeGraeve-Cruse, "The Callaway Family," online http://www.zianet.com/schulthe/Genes/Calloway/reports/…, viewed on 12 Nov 1998 (not giving her surname and stating that they married after 1731). [S14] "Descendants of Joseph Callaway of Virginia," The Callaway Journal, vol. 5 (1980), p. 76 (not giving the date or place but indicating that she was his second wife). [S542] Jill DeGraeve-Cruse, "The Callaway Family," online http://www.zianet.com/schulthe/Genes/Calloway/reports/…, viewed on 12 Nov 1998 (stating that they married before 1750 and not naming the place). [S724] Descendants of Joseph and Peter Callaway (n.p. : The Callaway Family Association, Inc., 2000), pp. 1-2. [S724] Descendants of Joseph and Peter Callaway (n.p. : The Callaway Family Association, Inc., 2000), p. 1 (stating that it "has been reported that she married James Stodgill (Sturgill)" but not giving the date or place). [S724] Descendants of Joseph and Peter Callaway, above, p. 1 (stating that it "has been reported that she married James Stodgill (Sturgill)"). Evelyn Vancleave Airhart's tombstone, Pisgah Cemetery, Beckville, Ind., courtesy of Marc Doty. Other Names*: Evelyn Van Cleave, Evelyn Van Cleave Airhart, Evelyn Airhart. [S905] Obituary of Evelyn VanCleave Airhart, online at http://www.rootsweb.com/~inmontgo, viewed on 26 Dec 2003 (citing Crawfordsville Journal Review, Crawfordsville, Ind., 24 Jul 1957), (naming Ransom Vancleave as her father). [S910] Obituary of Ransom VanCleave, online http://www.rootsweb.com/~inmontgo, viewed on 27 Dec 2003 (citing Waveland [Ind.] Independent, 30 Mar 1923), (naming Ransom VanCleave as her father). [S905] Obituary of Evelyn VanCleave Airhart, above, (naming Sarah Surface Vancleave as her mother). [S910] Obituary of Ransom VanCleave, 30 Mar 1923, above, (naming Sarah Zerface as her mother). [S905] Obituary of Evelyn VanCleave Airhart, above. 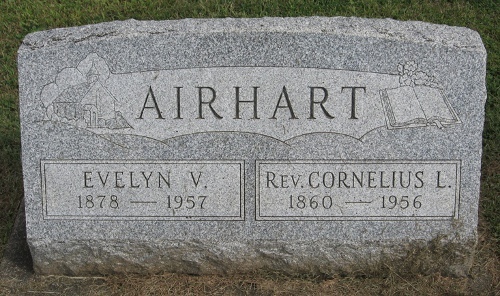 [S961] Find A Grave, online at http://www.findagrave.com, memorial for Evelyn V. Airhart, memorial no. 43167128, viewed on 21 Sep 2011 (giving the year but no other information). [S543] Roberta D. Owens, Rt. 2, Box 552, Alexandria, Ind. 46001, letter to Roger Bartlett, 7 May 1974, (giving only the year and not naming the place, citing "'death books' of Montgomery Co., Ind. by Mrs. Harold Walters"). [S905] Obituary of Evelyn VanCleave Airhart, above, (stating that they married on 20 Sep 1911 in Crawfordsville, Indiana). [S907] Obituary of Rev. Cornelius L. Airhart, online at http://www.rootsweb.com/~inmontgo, viewed on 27 Dec 2003 (citing Crawfordsville Journal Review, Crawfordsville, Ind., 12 Jan 1956) (stating that they married in 1911 in Montgomery County, Indiana). [S987] Frances Haynes Quinn, comp., Obituary Dates and Your Family Ties: Over 140 Years in Montgomery County, Indiana (Cottage Grove, Ore.: Cottage Grove Gen. Soc'y 1987), p. 4 (giving her surname as Van Cleave and giving the year but not the month or date or the place). [S961] Find A Grave, online, above, memorial for Evelyn V. Airhart, memorial no. 43167128, viewed on 21 Sep 2011 (giving the cemetery but not the date). Marriage*: She married Roden T. Crain. [S261] Louis Wiltz Kemp, The Signers of the Texas Declaration of Independence (Salado, Tex. : The Anson Jones Press, 1959), p. 315 (naming Rachel A. Fulgham as her mother). [S261] Louis Wiltz Kemp, The Signers of the Texas Declaration of Independence (Salado, Tex. : The Anson Jones Press, 1959), p. 315 (naming Benjamin Livingston Rusk as her father). [S261] Louis Wiltz Kemp, The Signers of the Texas Declaration of Independence (Salado, Tex. : The Anson Jones Press, 1959), p. 315 (naming Benjamin Livingston Rusk as his father). [S546] Jean Gibbons, e-mail to Roger Bartlett, 19 Feb 2000 (citing Evelyn Bergman Evans, Footprints with Footnotes, A Family History, The McConnico Family with Spann, Dargan, Russell, Sterling Connections [Houston, Tex. : A. V. Emmott and Sons, Bookbinders, Inc., n.d.]). [S546] Jean Gibbons, e-mail to Roger Bartlett, 19 Feb 2000 (citing Evelyn Bergman Evans, Footprints with Footnotes, A Family History, The McConnico Family with Spann, Dargan, Russell, Sterling Connections [Houston, Tex. : A. V. Emmott and Sons, Bookbinders, Inc., n.d.], naming Samuel Bacon McConnico as his father). [S546] Jean Gibbons, e-mail to Roger Bartlett, 19 Feb 2000 (citing Evelyn Bergman Evans, Footprints with Footnotes, A Family History, The McConnico Family with Spann, Dargan, Russell, Sterling Connections [Houston, Tex. : A. V. Emmott and Sons, Bookbinders, Inc., n.d.], naming James Lawrence Boyle as her father). [S546] Jean Gibbons, e-mail to Roger Bartlett, 19 Feb 2000 (citing Evelyn Bergman Evans, Footprints with Footnotes, A Family History, The McConnico Family with Spann, Dargan, Russell, Sterling Connections [Houston, Tex. : A. V. Emmott and Sons, Bookbinders, Inc., n.d.], naming Celestia Taney as her mother). [S546] Jean Gibbons, e-mail to Roger Bartlett, 19 Feb 2000 (citing Evelyn Bergman Evans, Footprints with Footnotes, A Family History, The McConnico Family with Spann, Dargan, Russell, Sterling Connections [Houston, Tex. : A. V. Emmott and Sons, Bookbinders, Inc., n.d.], naming Mary Lewis Boyle as his mother). Marriage*: He married Celestia Taney. Marriage*: She married James Lawrence Boyle. [S546] Jean Gibbons, e-mail to Roger Bartlett, 19 Feb 2000 (citing Evelyn Bergman Evans, Footprints with Footnotes, A Family History, The McConnico Family with Spann, Dargan, Russell, Sterling Connections [Houston, Tex. : A. V. Emmott and Sons, Bookbinders, Inc., n.d.], naming Alexander Douglas McConnico as his mother). [S605] Register 1, St. Andrew's Episcopal Church, Bryan, Tex., online http://www.standrewsbcs.org/1-families.htm, downloaded 4 Mar 2001, p. 64 (naming Alex. D. McConnico as his father). [S546] Jean Gibbons, e-mail to Roger Bartlett, 19 Feb 2000 (citing Evelyn Bergman Evans, Footprints with Footnotes, A Family History, The McConnico Family with Spann, Dargan, Russell, Sterling Connections [Houston, Tex. : A. V. Emmott and Sons, Bookbinders, Inc., n.d.], naming Martha Lavinia Winkler as his mother). [S605] Register 1, St. Andrew's Episcopal Church, Bryan, Tex., online, above, p. 64 (naming Larinin M. McConnico as his mother). [S605] Register 1, St. Andrew's Episcopal Church, Bryan, Tex., online, above, p. 64. [S546] Jean Gibbons, e-mail to Roger Bartlett, 19 Feb 2000 (citing Evelyn Bergman Evans, Footprints with Footnotes, A Family History, The McConnico Family with Spann, Dargan, Russell, Sterling Connections [Houston, Tex. : A. V. Emmott and Sons, Bookbinders, Inc., n.d.], naming Alexander Douglas McConnico as her mother). [S605] Register 1, St. Andrew's Episcopal Church, Bryan, Tex., online http://www.standrewsbcs.org/1-families.htm, downloaded 4 Mar 2001, p. 64 (naming Alex. D. McConnico as her father). [S546] Jean Gibbons, e-mail to Roger Bartlett, 19 Feb 2000 (citing Evelyn Bergman Evans, Footprints with Footnotes, A Family History, The McConnico Family with Spann, Dargan, Russell, Sterling Connections [Houston, Tex. : A. V. Emmott and Sons, Bookbinders, Inc., n.d.], naming Martha Lavinia Winkler as her mother). [S605] Register 1, St. Andrew's Episcopal Church, Bryan, Tex., online, above, p. 64 (naming Larinin M. McConnico as her mother). [S549] Maria H. Evans, Aberdeen, Miss., "D.A.R. Chart," handwritten, undated, Holliday Family vertical file, Evans Memorial Library, Aberdeen, Miss., (naming Jesse Speight as her father). [S549] Maria H. Evans, Aberdeen, Miss., "D.A.R. Chart," above, (naming Mary ['Polly'] May as her mother). [S462] Judge Baxter McFarland, Holliday Family, above, (naming Mary ['Polly'] May as her mother). [S548] Transcript of 1843 Holliday bible, Holliday Family vertical file, Evans Memorial Library, Aberdeen, Miss., (giving the date but not the place). These two undated pages are a transcript of a bible published in 1843, originally owned by Mrs. John Holliday, and owned by Mrs. Julian Evans, Aberdeen, Miss., when transcribed. [S547] Transcript of 1807 Holliday bible, Holliday Family vertical file, Evans Memorial Library, Aberdeen, Miss., (giving the date but not the place). This undated single page is a transcript of William Holliday's bible published in 1807 and owned by Mrs. Ben McFarland, Aberdeen, Miss., when transcribed. [S548] Transcript of 1843 Holliday bible, above, (naming Maria G. Holliday as her mother). [S462] Judge Baxter McFarland, Holliday Family, above, (naming Maria Grimes Speight as her mother). [S548] Transcript of 1843 Holliday bible, above, (naming Maria G. Holliday as his mother). [S462] Judge Baxter McFarland, Holliday Family, above, (naming Maria Grimes Speight as his mother). [S547] Transcript of 1807 Holliday bible, Holliday Family vertical file, Evans Memorial Library, Aberdeen, Miss., (suggesting that William Holliday was her father). This undated single page is a transcript of William Holliday's bible published in 1807 and owned by Mrs. Ben McFarland, Aberdeen, Miss., when transcribed. [S548] Transcript of 1843 Holliday bible, Holliday Family vertical file, Evans Memorial Library, Aberdeen, Miss., (naming William Holliday as his father). These two undated pages are a transcript of a bible published in 1843, originally owned by Mrs. John Holliday, and owned by Mrs. Julian Evans, Aberdeen, Miss., when transcribed. [S548] Transcript of 1843 Holliday bible, Holliday Family vertical file, Evans Memorial Library, Aberdeen, Miss., (naming John Holliday as her father). These two undated pages are a transcript of a bible published in 1843, originally owned by Mrs. John Holliday, and owned by Mrs. Julian Evans, Aberdeen, Miss., when transcribed. [S462] Judge Baxter McFarland, Holliday Family, above, (not giving the date). [S549] Maria H. Evans, Aberdeen, Miss., "D.A.R. Chart," handwritten, undated, Holliday Family vertical file, Evans Memorial Library, Aberdeen, Miss. [S462] Judge Baxter McFarland, Holliday Family, above, (stating that she was born on 19 May 1854). [S549] Maria H. Evans, Aberdeen, Miss., "D.A.R. Chart," above, (naming Maria S. Holliday as her mother). [S462] Judge Baxter McFarland, Holliday Family, above, (naming Maria Speight Holliday as her mother). [S548] Transcript of 1843 Holliday bible, above, (giving the date but no other details). [S462] Judge Baxter McFarland, Holliday Family, above, (naming Mary Ann Holliday as her mother). [S548] Transcript of 1843 Holliday bible, Holliday Family vertical file, Evans Memorial Library, Aberdeen, Miss., (naming John Holliday as his father). These two undated pages are a transcript of a bible published in 1843, originally owned by Mrs. John Holliday, and owned by Mrs. Julian Evans, Aberdeen, Miss., when transcribed. [S548] Transcript of 1843 Holliday bible, Holliday Family vertical file, Evans Memorial Library, Aberdeen, Miss.. These two undated pages are a transcript of a bible published in 1843, originally owned by Mrs. John Holliday, and owned by Mrs. Julian Evans, Aberdeen, Miss., when transcribed. [S549] Maria H. Evans, Aberdeen, Miss., "D.A.R. Chart," handwritten, undated, Holliday Family vertical file, Evans Memorial Library, Aberdeen, Miss., (naming Thomas W. Elkin as his father). [S549] Maria H. Evans, Aberdeen, Miss., "D.A.R. Chart," above, (naming Adelia Valmon Lucas as his mother). [S462] Judge Baxter McFarland, Holliday Family, above, (stating that he was born in 1832 without giving other details). [S549] Maria H. Evans, Aberdeen, Miss., "D.A.R. Chart," above, (naming William G. Elkin as her father). [S462] Judge Baxter McFarland, Holliday Family, above, (naming Wm G. Elkin as her father). Judge Baxter McFarland, from Confederate Veteran, vol. XXXIII, p. 265 (July 1925), courtesy of David Chapman. Birth*: He was born on 15 May 1839 in Lafayette County, Mississippi. Death*: He died on 7 February 1925 in Aberdeen, Monroe County, Mississippi, at age 85. • In 1919 Judge McFarland wrote a history of the Holliday Family, which is available here. • His obituary in the magazine Confederate Veteran is here. • An obituary of him also appears here. [S462] Judge Baxter McFarland, Holliday Family, above, (naming Hon. 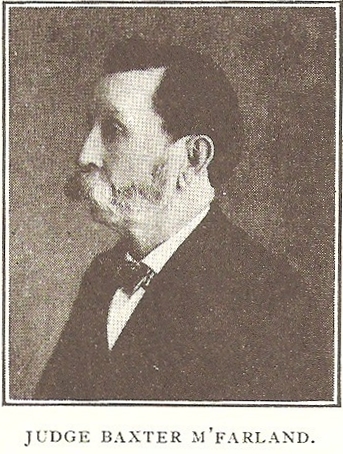 Baxter McFarland as his father). [S462] Judge Baxter McFarland, Holliday Family, above, (naming Hon. Baxter McFarland as her father). [S1222] Biography of Ben Holliday McFarland, above, (naming Baxter McFarland as his father). [S549] Maria H. Evans, Aberdeen, Miss., "D.A.R. Chart," handwritten, undated, Holliday Family vertical file, Evans Memorial Library, Aberdeen, Miss., (naming William G. Elkin as her father). [S462] Judge Baxter McFarland, Holliday Family, above, (naming Maria Holliday Elkin as her mother). [S462] Judge Baxter McFarland, Holliday Family, above, (naming Maria Holliday Elkin as his mother). [S462] Judge Baxter McFarland, Holliday Family, above, (naming Julian T. Evans as her father). [S462] Judge Baxter McFarland, Holliday Family, above, (naming Julian T. Evans as his father). 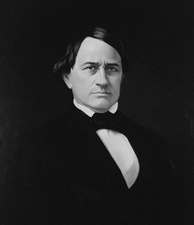 Sen. Jesse Speight, from Biographical Directory of United States Congress online. • His biography from the Biographical Directory of the United States Congress is here. • Wikipedia has a similar biography of him here. [S549] Maria H. Evans, Aberdeen, Miss., "D.A.R. Chart," handwritten, undated, Holliday Family vertical file, Evans Memorial Library, Aberdeen, Miss., (naming Seth Speight as his father). [S549] Maria H. Evans, Aberdeen, Miss., "D.A.R. Chart," above, (naming Elizabeth Vines as his mother). [S462] Judge Baxter McFarland, Holliday Family, above, (giving the year but no other details). [S549] Maria H. Evans, Aberdeen, Miss., "D.A.R. Chart," above, (naming Jesse Speight as her father). [S462] Judge Baxter McFarland, Holliday Family, above, (naming Gen. Jesse Speight as her father).